We don't teach – we inspire! We help you change the world! A process is a group of activities, not just one. Value is created not by single activities, but by the entire process in which all these tasks merge in a systematic way for a clear purpose. Activities are related and organized. They present a stream of relevant, interconnected activities that must be performed in sequence – the right things in the right way – to produce the desired outcome. Process are not ends in themselves. They have a purpose, they create and deliver results that customers care about. This definition is easy to apply in the context of the work activities and tasks within a single department or functional group.2 If the employees of different functional groups lack a common purpose and direction, each one will inevitably work at cross-purpose with the others. 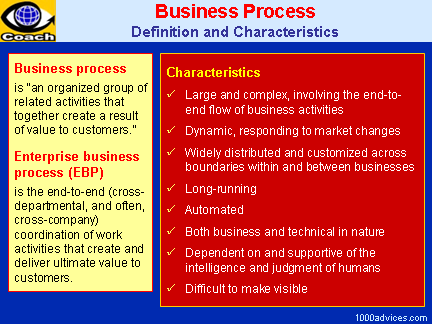 Cross-functional management (CFM) manages business processes across the traditional boundaries of the functional areas. Your web browser does not support frames.